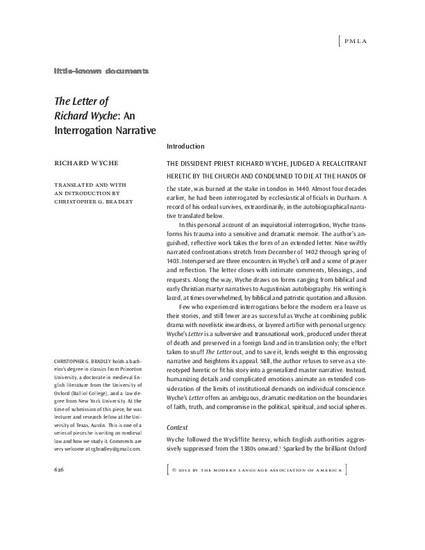 This is a translation, with introduction, of the Letter of Richard Wyche—one of only two heresy interrogation narratives from medieval England written from the perspective of the accused heretic. The Letter is an autobiographical account of Richard Wyche’s interrogation, in 1402-1403, at the hands of church officials. Wyche originally composed the Letter in (Middle) English but it survives only in a Latin translation, alongside other forbidden texts in a manuscript now in Prague. Wyche wrote and covertly sent away this Letter to an audience of intimates sympathetic to the cause (the so-called Wycliffite or Lollard heresy) before his interrogations ended. Ultimately, Wyche was freed and lived several decades before he was finally burned at the stake for his heretical beliefs, in 1440. Few similar narratives survive from the pre-modern era, and none combines public drama with novelistic inwardness, or layered artifice with personal urgency, as does the Letter. Not just a literary or religious artifact, the letter is a legal narrative comfortable alongside classics such as those presented by Natalie Zemon Davis (Fiction in the Archives) and R. Po-Chia Hsia (Trent 1475). The Letter is a counter-authoritarian and transnational work, produced under enormous pressure and preserved in an alien land and alien language. The fact that such effort was taken to snuff it out, and to save it, lends all the more weight to this engrossing narrative. Still, the author refuses to serve as a stereotyped “heretic” or fit his story into a generalized master narrative. Instead, humanizing details and complicated emotions serve as the engines of an extended consideration of the limits of institutional demands on individual conscience. Wyche’s Letter offers an ambiguous, dramatic meditation on the boundaries of political, spiritual, and social faith, truth, and compromise.